• Braylon Heard says he has achieved the score needed to qualify academically. • Another Big Ten school adds a familiar face to its coaching staff. • Ahman Green confirms reports from early February that he's headed to Montreal. • Bob Stoops will headline the Nebraska Football Spring Coaches Clinic. • From Husker Locker: Know your Huskers and know your Big Ten recruits. • Sam McKewon wonders if Bo Pelini will change how he manages the Huskers. • Mike Ekeler sizes up the Big Ten offenses and how they affect a defense's scheme. • The depth chart could get an overhaul along with the offense's scheme. • Bo Pelini lends his motivational skills to the tennis team. • It's a condensed group of recruits in Lincoln for junior day. • Ready for the NFL Combine: Prince Amukamara | Niles Paul | Roy Helu Jr.
• A top Big Ten official talks about NU, scheduling challenges and the TV landscape. • Alex Henery plans to let his skills do most of the talking at the NFL Combine. • The son of 1970s Husker Wonder Monds signs to play football at Buffalo. • Dennis Dodd has Memorial Stadium at No. 7 in his ranking of college football venues. • Blake Lawrence tells what's at stake in the effort to reduce brain injuries in sports. • Ted Gilmore's hiring by Southern Cal is now official. • It's time for nine Huskers to show their stuff at the NFL Combine. • Nebraska is in three out of the five games to watch in the Big Ten this season. • Don't miss Patrick Kabongo & Chris Kelsay on Saturday's Legends Radio Show. • The LJS looks at the contenders for key roles on the offensive line. • The break during spring drills is a new wrinkle at NU, but it's not unique. • Angry Dad looks at potential Big 10 rivalries and reflects back on the Big 12 ones. • The Big 12's reduced inventory makes it tough to create enough TV-worthy games. • More on the new guys: John Garrison is making his biggest position switch yet. Corey Raymond is ready to tap his NFL experience. • Sam McKewon's Monday takes: On Bo's staff choices and Doc's clutch coaching. • The Lincoln and Omaha papers look at the qualities of new assistant Rich Fisher. • Tom Osborne discusses differences between armchair QB'ing and real play-calling. • Bo Pelini saw the right fit in new assistants Rich Fisher & John Garrison. • A thinner playbook and more audibles are in Bo Pelini's plans for the offense. • Tim Beck moves under the microscope. | Els big on accountability | Gilmore to USC? • With spring ball just three weeks away, peruse the 11 roster, now sortable by state. • QB recruit Bubba Starling says he's fine with the changes on offense. • Eric Crouch isn't surprised to see John Garrison move up the coaching ladder. • Former NU defensive coordinator Kevin Cosgrove joins the staff at Akron. • Hear stories from Cory Ross and Titus Adams on Saturday's Legends Radio Show. • Husker Dan adds up some numbers that help define NU's last 11 years in the Big 12. • Tom Shatel says farewell to John Lyons, a rare breed of football fan. • Shawn Watson reportedly has landed at Louisville as quarterbacks coach. • Watch as Sipple & Christopherson analyze the competition at running back. • The university directory provides apparent confirmation of three coaching hires. • Ahman Green has agreed to terms with the Montreal Alouettes of the CFL. • Nebraska had three of the top one-man shows of 2010 in the Big 12. • Spring game ticket sales have topped 35,000. • A Tulsa scribe omits "golf pro" Rich Fisher's football credentials until the very end. • Sam Keller's lawsuit against EA Sports has Hollywood against him. • Bob Wagner, a co-captain on Nebraska's 1955 Orange Bowl team and recipient of the Tom Novak Trophy, has died in Arizona at age 81. • Sam McKewon's Monday takes touch on recruiting, staff changes and the Big Ten. • Harrison Beck lands with the Alabama franchise of the Indoor Football League. • See how Rivals.com ranks the Big Ten recruiting classes by position. • John Bishop examines the reported hires in a special edition of Sunday School. • Share tailgating culinary ideas in the new Max's Kitchen section of the BBS. • A November article from Boston provides insights about coach Rich Fisher. • Nebraska appears set to return to a system of two offensive-line coaches. • A new name emerges in the coaching speculation: Rich Fisher. • Husker Dan goes over some history about NU against Top 10 competition. • Tommie Frazier will speak at a South Florida Huskers luncheon on April 2. • The LJS explains the reasons behind this year's unusual spring schedule. • The K.C. Star is the latest to report on the decision that looms for Bubba Starling. • Troy Watchorn & Jason Schwab will be Saturday's Legends Radio Show guests. • ESPN lists Tim Beck as one of the top recruiters among assistant coaches. • It's not all about football as Eric Hagg makes an appearance at Lexington High. • Bo Pelini is believed to have completed his staff changes. • Sipple & Christpherson break down the competition at quarterback. • Seventy Huskers are named to the Big 12 honor roll for the fall semester. • Brandon Jackson isn't about to take the Packers' Super Bowl win for granted. • Former Husker Kenny Wilson signs with the Nebraska Danger of the IFL. • An NFL job could be in the works for Shawn Watson. • Angry Dad weighs in on the anticipated changes in the offense. • ESPN.com's David Ubben recaps an eventful 12 months in Nebraska football. • There are a few tickets left for the Pelini, Osborne, Perlman event in California. • Tim Beck is a coach who is no stranger to taking on tough projects. • It seems the timing just wasn't right for Scott Frost & Bo Pelini. • Scott Frost intends to stay put at Oregon, the LJS reports. • Dirk Chatelain doesn't see Bo Pelini picking another stranger as offensive coordinator. • Sam McKewon shoots down the notion that the media is out to get Bo. • Congrats to Brandon Jackson, soon to get his Super Bowl ring. 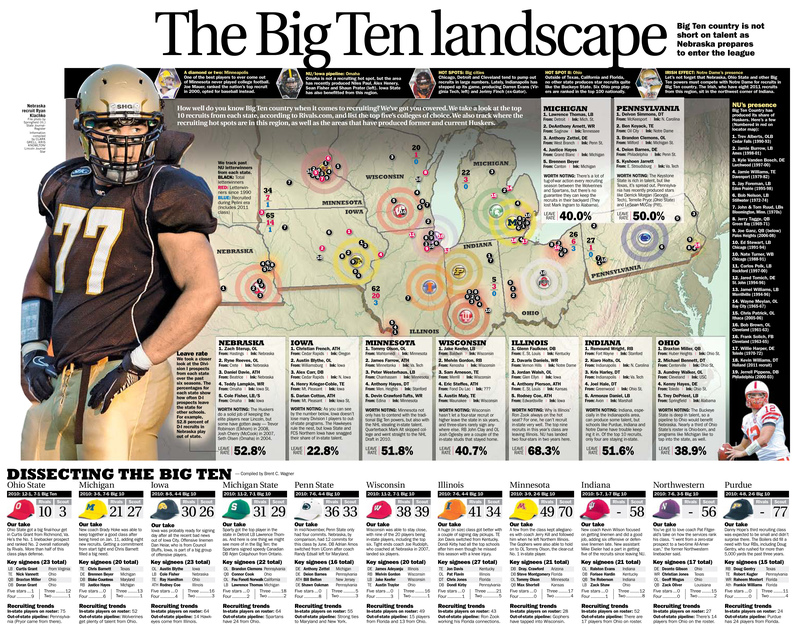 • Check out the LJS's map of the recruiting landscape of Big Ten country. • Ron Brown will speak March 12 at Northeast Kansans for Nebraska's Founder's Day. • Charles Jackson's dad says all's well between the recruit and the NU staff. • An Oregon source confirms Nebraska's interest in Scott Frost. • Charles Jackson isn't happy about being out of the loop about Marvin Sanders. • Former Husker Dave Redding gets ready for the Super Bowl as a Packers staffer. • Ndamukong Suh wins another NFL Rookie of the Year honor. • Bo Pelini announces the resignation of Marvin Sanders as secondary coach. • The conference change becomes more tangible today as the Big Ten Network includes NU in its recruiting coverage and 11 new rivals size up the Husker class. • It's a day to dream big about the future, including a promising bunch on the O-line. Will Nebraska be able to snag one more big fish on signing day? • Bo Pelini opts for a signing-day teleconference instead of the usual press conference. • Aurora's Tyson Broekemeier will walk on and join the competition at quarterback. • Former Husker Sam Koch signs a five-year deal that keeps him with the Ravens. • Get to know the three 2011 recruits already on campus: Turner, Williams & Moore. • Nine Huskers receive official invitations to the NFL Combine. • Linebacker David Santos might be one of the steals of the recruiting class. • NU will be near the bottom of the Big Ten in terms of returning starters in 2011. • Walk-on defensive tackle Justin Jackson is ticketed for DUI. • Order your copy of Big Red Rivals, the acclaimed OWH book in its second printing.